You know when you just are craving breakfast for dinner? Well, this was a product of one of those nights. I saw a great tutorial on poaching eggs here and wanted to test it out. It worked perfectly! So easy and simple. I sauteed some spinach and shitaki mushrooms and layered it in a ramekin, topped with the poached egg. Next time I think I'll top it off with some feta. Delicious! 1 While egg is poaching, saute spinach over medium heat until softened with some salt 'n' peppa. 2 Remove spinach once done, and in the same pan saute mushroom with thyme until softened. 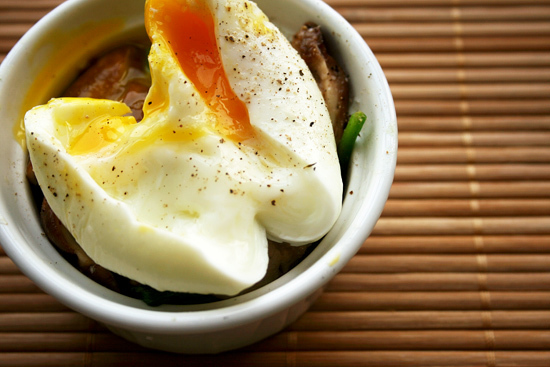 3 Layer ramekin with spinach, mushroom and poached egg. Top with freshly ground pepper. Yes! This is where it's AT! You poach your egg so beautifully. I love poached eggs on top of just about anything. Great pictures! I haven't had breakfast yet and this post is making my stomach growl! That looks incredible, I have to give it a try. Love everything you do and your photos are always so gorgeous. Thanks for sharing! Have a great weekend! This is a perfectly cooked egg and it looks so beautiful. Good job, Zoe. That really is a beautifully poached egg. Poached eggs were not served in my house as a kid, but that trends start with my little ones (when and if I have them!). This looks delicious, and I love how healthy it is! I love the simplicity of this dish. I love spinach and eggs but am not a big fan of mushrooms. Hi Zoe, nice to meet you and thanks for visiting my blog. Breakfast for dinner is a firm favorite in this household, and poached farm eggs are so good on so many things. Also, love your braised leeks in the toaster oven--simple, brilliant! YUM-O combO. Nothing like a bit of yolk running over some delicious veggie. oh wow the egg yolks is still creamy. Perfect! mmm... I'm gonna have to try this. I've been putting off making poached eggs for some time now. this looks like a good recipe to start with! Yum! I love having breakfast for dinner too :) And your poached egg looks very delicious. Will try this soon! Oh my goodness I have no idea how on earth you found my little blog but thank you so stopping by I totally gaga over the food on yours!